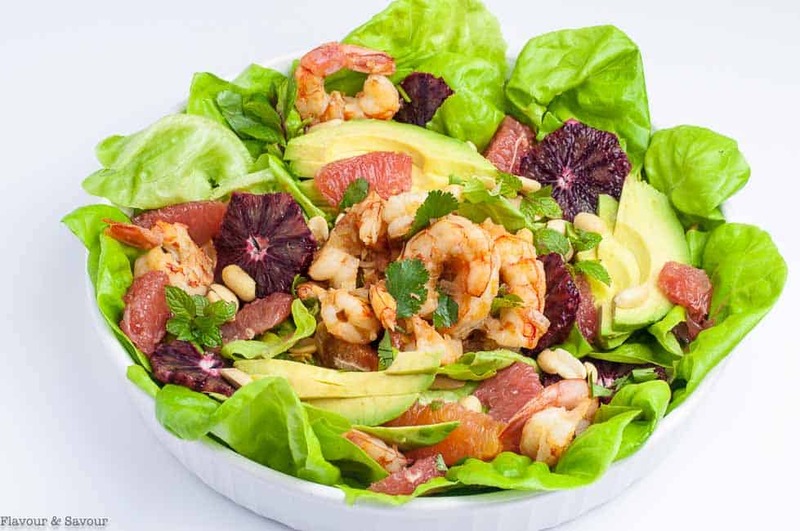 This Thai Shrimp Salad with Grapefruit and Mint has it all: shrimp, avocado, shallots, cilantro, and grapefruit, all topped off with fresh mint and crunchy salted peanuts. 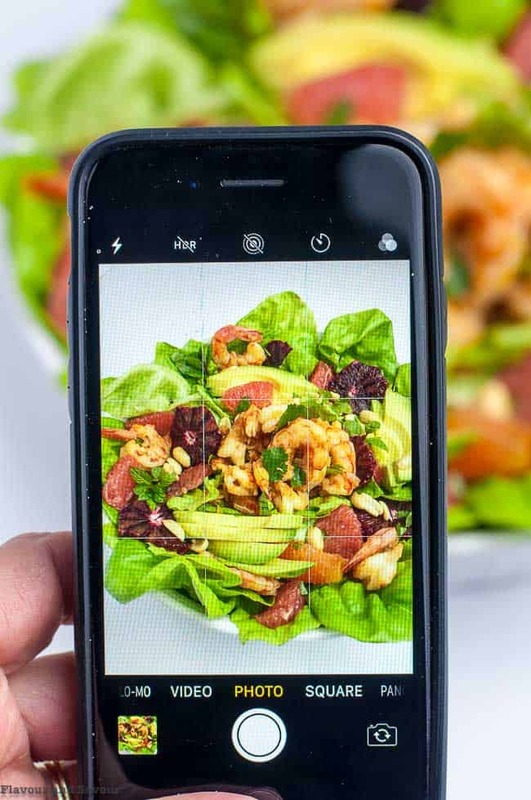 Are you looking for a recipe to take your go-to Shrimp Salad to the next level? 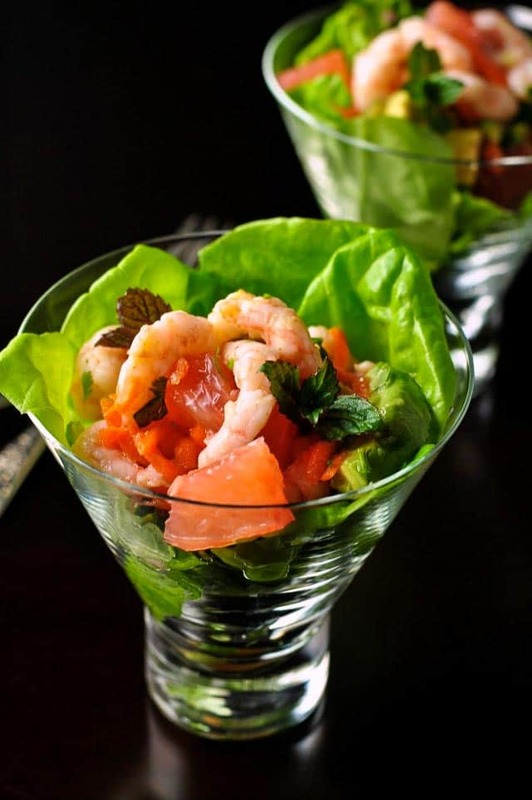 Kick it up a notch with this Thai Shrimp Salad with Grapefruit and Mint! 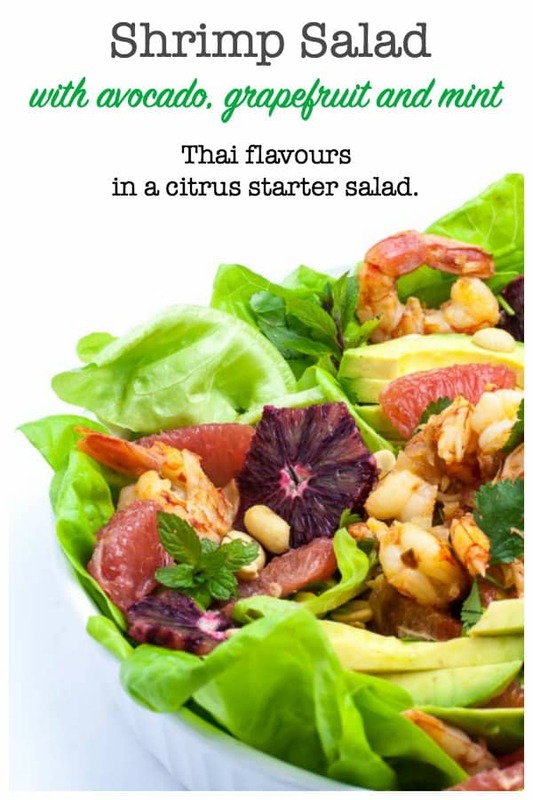 Tender butter lettuce, sweet rosy pink grapefruit and blood oranges form a bed for gently Thai-spiced shrimp with a hint of heat. I made this colourful salad on the weekend. 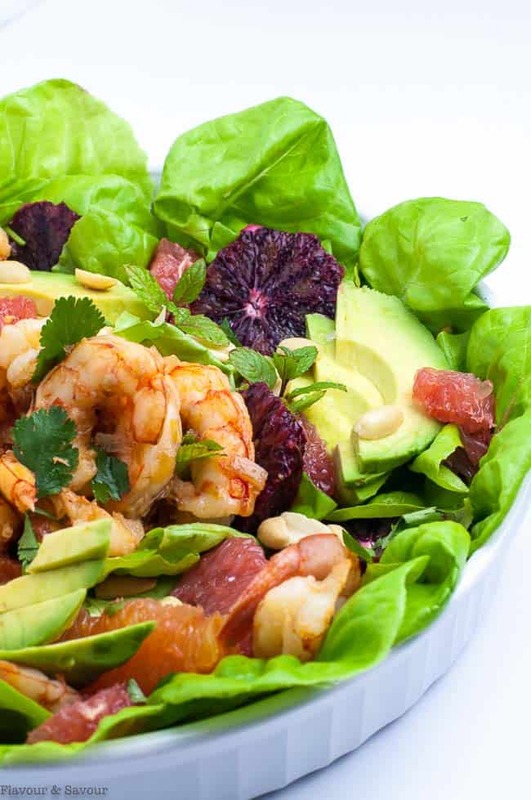 Everyone around the table agreed that this shrimp avocado salad recipe is a keeper! It has so many contrasting layers of flavour and texture. This dish is definitely not your ho-hum old-fashioned shrimp cocktail served in a soda fountain glass with bottled cocktail sauce! Once Spring decides it’s really here to stay, Denis and I will be itching to put the boat in the water and head out into the Gulf Islands. Right now I can see the water sparkling in the sunshine on the bay, but it’s still a little cool here for a day on the ocean. This year, we have resolved to put the prawn and crab traps down more often. I get a huge amount of satisfaction from being able to harvest vegetables, berries and herbs from our garden and we’re grateful that we’re able to gather fresh fish and shellfish from local waters too. In the meantime, I will have to make do with West Coast shrimp from our local seafood market. 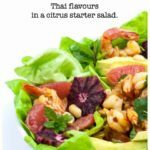 It’s fresh and tasty and it’s absolutely delicious in this Thai-inspired shrimp and avocado butter lettuce starter salad! 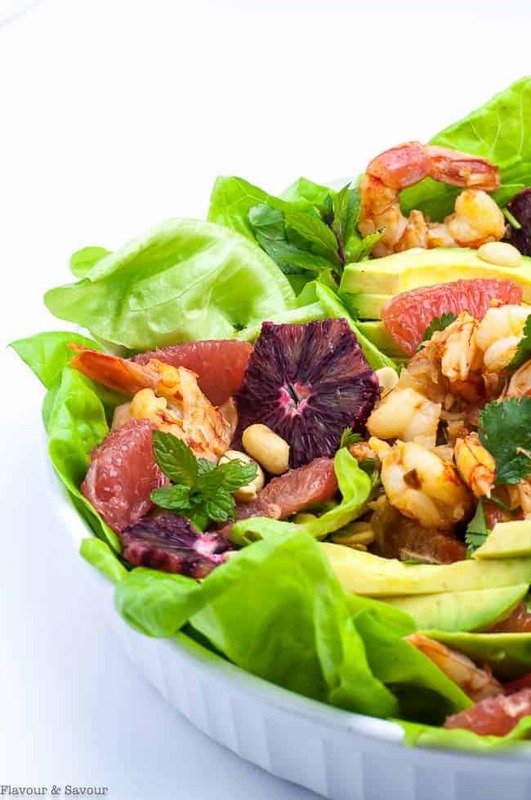 This starter salad has it all: shrimp, avocado, shallots, carrot, cilantro, and grapefruit, all topped off with some fresh mint and crunchy salted peanuts. At first glance, these ingredients seem like unlikely partners, but they work perfectly well together. I assure you, this combination of flavours is stellar! Ready to try it? Let’s make a shopping list! mint: a few leaves. Don’t leave these out! They add a beautiful flavour to the salad. peanuts: dry roasted, salted. These add that necessary crunch! tamari: or coconut aminos or soy sauce. Your choice, depending on your diet. Begin by preparing the marinade. In a small jar, combine the lime juice, grapefruit juice, tamari (or soy sauce), fish sauce, sriracha sauce, salt and sugar. Store in the fridge. Next, chop the shallot, sauté the slices in the avocado or peanut oil in a medium sauté pan over medium-high heat until caramelized, about 10 minutes. Set aside to let them cool. Remove the peel from the grapefruit. Segment the slices by removing them from the membrane with a sharp knife. Here’s an easy tutorial. Salt them lightly and store in the fridge. Next, peel the blood orange and remove as much of the pith as you can. A gentle scrub with a vegetable brush will help with this job. Slice the fruit horizontally into 1/2 inch rounds. Wash and dry enough butter lettuce leaves for four servings. Grate the carrot and refrigerate. Chop the cilantro and slice or dice the avocado. Tear the lettuce leaves into bite-sized pieces and arrange on a serving platter or portion into four serving dishes. Add the grapefruit segments and blood orange slices and the shrimp mixture on top, drizzling with a little of the excess marinade. Garnish with chopped peanuts and ribbons of thinly sliced mint and serve. Make a meal around this starter Thai Shrimp Salad! If you want to keep your meal focused on seafood, serve this Citrus Glazed Baked Salmon with Sake, Crispy Lemon Oven-Roasted Potatoes and 5 – minute Sesame Asparagus. Or keep your meal prep very simple and serve this Thai Chili Sheet Pan Salmon. If you prefer chicken, Easy Thai Baked Chicken with Never-Fail Never Fail Thai Coconut Rice will complement the Thai flavours in this shrimp salad, or serve this Asian-Glazed Garlic Chicken and Sesame Ginger Green Beans. Finish off the meal with a dessert everyone loves: Caramel Almond Crunch Nice Cream. Expect rave reviews when you serve this shrimp salad at your next dinner party! Enjoy every bite. 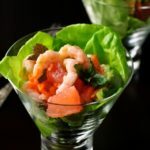 Tangy citrus, creamy avocado and fresh herbs flavour this fabulous Asian-inspired recipe for shrimp salad with grapefruit and mint. In a small jar, prepare the marinade by mixing the lime juice, grapefruit juice, soy sauce, fish sauce, sriracha sauce, salt and sugar. Store in the fridge. Chop the shallots, sauté them in the avocado or peanut oil in a medium sauté pan over medium-high heat until caramelized, about 10 minutes. Let them cool and set aside. Remove the peel from the grapefruit. Segment the slices by removing them from the membrane with a sharp knife. Here's an easy tutorial. Salt them lightly and store in the fridge. Wash and dry enough lettuce leaves for four servings. Rinse the shrimp and pat dry. Put the shrimp in a large bowl and add the carrots, cilantro, avocado and shallots. Add the marinade mixture and toss. Let the shrimp marinate for 20 minutes in the refrigerator. This recipe is adapted from Becky Selengut’s fabulous cookbook, Good Fish: Sustainable Seafood Recipes from the Pacific Coast. If you’re a seafood lover, you’ll love this book. It has seventy-five incredible recipes with wine-pairings. It also includes a host of useful instructions for handling and preparing all types of seafood. This post was originally published in 2015. It has been updated with new photos and instructions.